This book highlights the most recent developments in the area of research, policy and practice. All the authors are well known in the field of dyslexia and they will offer significant contributions at the forthcoming BDA conference ' Dyslexia: the dividends from research to policy and practice' to be held at Warwick University in March 2004. In addition to the opening chapter, which provides an overview of developments in dyslexia, there are also chapters on the research associated with neurological factors, the cerebellum, genetics and the links between research and practice. The policy section provides insights into policy developments from Europe, the UK and the United States, as well as polic developments relating to both children and adults. The practice section is comprehensive with chapters on multilingualism, the range of specific learning difficulties, ICT, mathematics, the implications for the classroom from the science of learning and the features of dyslexia friendly schools. Gavin Reid Ph.D., M.A, is an independent international educational psychologist. He is a director of the Red Rose School in the UK and Global Educational Consultancies. He is also a consultant to the Institute of Child Education and Psychology, Europe, the Open University and the BBC in the UK and the Child Early Intervention Medical Center in Dubai. He was a visiting professor at the University of British Columbia in Vancouver, Canada in the Department of Education and Counseling Psychology and Special Education. 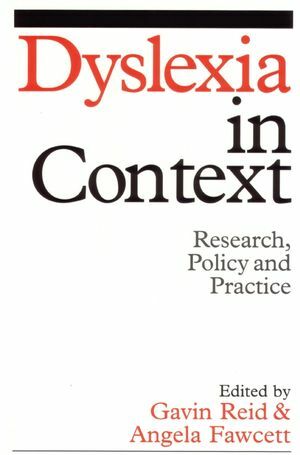 Angela Fawcett is the editor of Dyslexia in Context: Research, Policy and Practice, published by Wiley. The Context - Today and Tommorrow, an Overview of Developments. Insights and Innovations in Dyslexia. The Role of The Cerebellum. How to Develop Flexible Mapping in an Inflexible System. Brain-based Assessment and Instructional Intervention. Understanding and Challenging The Constaints in Functional Reading and Writing systems. Policy for Inclusion on Both Sides of The Atlantic - Dimensions and developments. Policy for Inclusion in The UK and Usa. Dyslexia and The workplace - Policy for an Inclusive Society. Dyslexia - Early Identification and Intervention - UK and Usa. The Case for Dyslexia Friendly Schools. Dyslexia Friendly Schools - policy and Practice. Learning fom The Science of Learning. Baseline Assessment and The Early Identification of Dyslexia. Dyslexic Pupils and The key Objectives of The National Numeracy Strategy. ICT and Dyslexia, The Co-occurence of Specific Learning Difficulties. The co-occurence of Specific Learning Difficulties. Implications for Identification and Assessment.